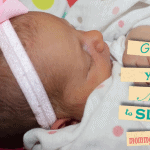 The right breast pump not only makes pumping easier, it saves you a ton of time. See which pumps we think are best below. 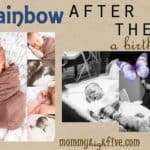 Working in corporate America and being a mother can be complicated at times, especially when nursing a baby. It used to be that mothers had to chose between breastfeeding their babies and a career. Today that is not the case. Thanks to the modern day breast pump, mothers like me can still nurse their babies even while working full-time. Breastfeeding is a beautiful thing, one of the most beautiful things that exist in nature. Think about how a woman can literally feed her baby with her body! In my eyes, this is a certain form of beauty, of divinity! To know that my body can not only form and bring another human being into the world, but that I can actually feed babies with my own milk from my own breasts— that puts me in a state of awe each time I think about it. It is an honor to be a woman. Nursing is not always easy, at least not for me, and I want to share. I understand it is not for everyone. No one told me it would hurt at first and that I would have to teach my newborn how to nurse. It took a good solid two weeks before nursing started to become easier. I often tell other expecting first time mothers that nursing is not easy, but if they can stick with it for two weeks it will start to get better and soon will become much easier. 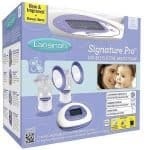 This pump is great if you’re planning on nursing part of the time. If you’re pumping full-time continue on down the list. This breast pump allows you to pump both sides at the same time. This helps save you time over having to pump one side at time. The design prevents milk backup and is easy to clean. It features 32 settings, helping you find the perfect combination of suction and speed that is most comfortable for you. There is a shoulder bag, drawstring bag, and cooler for caring your pump and its parts discreetly when traveling to and from work. This is a great pump for those who are planning to primarily nurse and supplement with pumping. How long it takes to pump will vary from woman to woman, however, most report it taking about 20+ minutes to empty both sides and longer when pumping one side at a time. 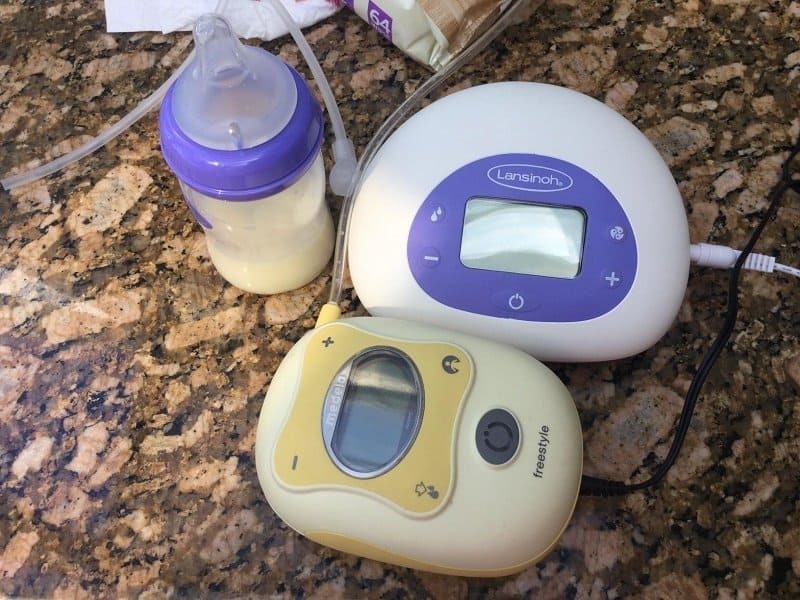 Lansinoh is a brand associated with its nursing supplies such as nursing pads and storage bags, but they also now offer an amazing electric breast pump. To help ensure you keep your milk supply, even when away from your baby, this pump is designed to mimic how a baby naturally nurses. It also offers you the option to pump both sides simultaneously. It features an LCD timer for when you only have a short time to pump, like on your 15-minute break at work. As a plus, some women reported it taking just 10 minutes to pump! The only downside to this pump is that you will need to purchase a separate carrying case and cooler for when you are traveling. The Medela electric breast pump has been considered by many as the gold standard of breast pumps and for good reason. But for many, the Medela is out of their budget range, until now. The Swing Breast pump is small, light, and affordable. 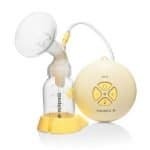 The Swing Breast Pump features Medela’s 2-Phase Expression(R) technology, which is similar to a baby nursing, for the most comfortable and effective results. This pump comes with all the accessories you need to get started along with a drawstring bag for travel; you will still need a separate cooler. While this pump is effective and fast, keep in mind the time it will take to pump a single side at a time when away from your baby. 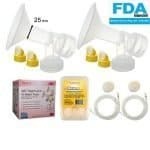 This Medela Freestyle Double Breast Pump is compact and very light. It comes with a 3-hour rechargeable battery, making it easier to pump on the go. 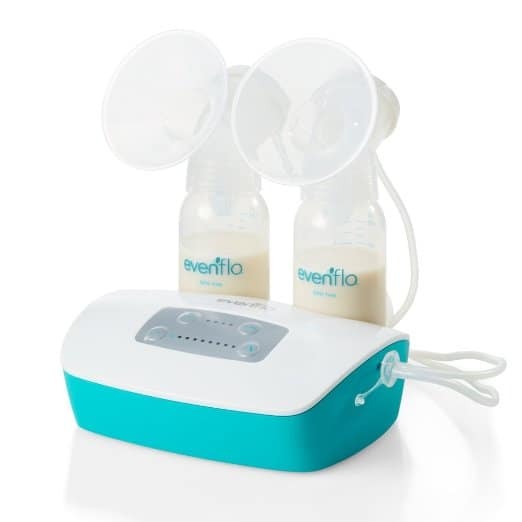 This makes it ideal for mothers who need to pump multiple times a day. 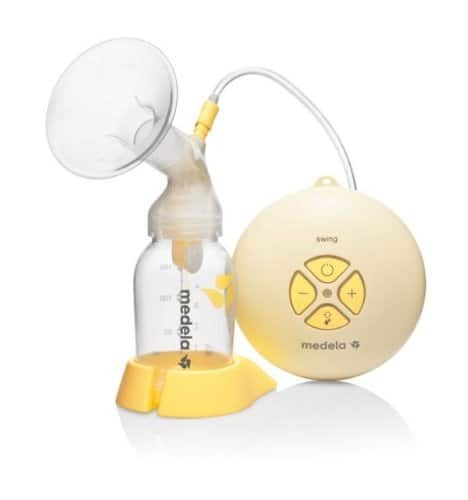 Like the Swing pump, it includes Medela’s exclusive pumping technology which helps you to pump faster. The Freestyle also gives you the ability to adjust the pumps speed and vacuum settings. Other great features include the one-touch let-down button, breast shields for additional comfort, and a lit digital display which is great for those late-night pumping sessions. In addition, it offers a memory button and timer which allow you to track your pumping sessions, saving you even more time. The pump set includes everything you need to pump all in a discreet tote bag to keep your pumping essentials organized. It also includes a removable cooler bag with contoured ice pack. And the number 1 pump is…another Medela: The Medela Pump in Style. I have personally had this pump for 17 years! Yes, 17 years and used it through 4 kids, and plan to use it again with my next child. The only things I have ever replaced on this pump are the accessories, which you can purchase for less than $20 in a convenient kit. Just like the Swing and Freestyle, this pump features the Medela 2-Phase Expression technology, which produces more milk in less time. It comes in a discreet and stylish bag that holds your pump for you. 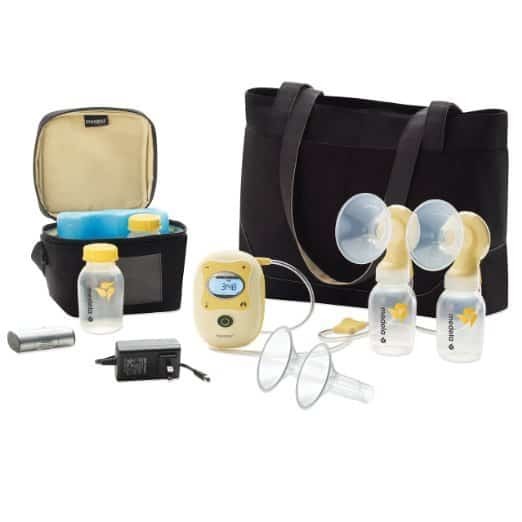 The Pump in Style comes with a removable cooler bag and ice pack that can hold up to four breast milk bottles while you are pumping away from home. While every pump featured offers the ability to function on batteries and/or a plug, this one also offers an AC adapter for when you are on the road (please don’t drive and pump,–leave the driving up to another responsible adult). With each child, I learned new tricks to making it easier and easier to the point I no longer worry about juggling all my kids, a baby, work, and nursing. 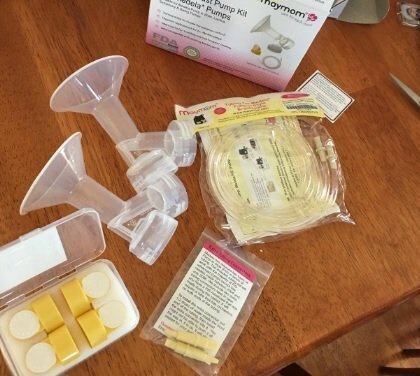 While some wait to start pumping their breast milk until they are about to go back to work, I have learned for myself it is best to start pumping right away; this helps ensure I keep my milk supply longer and to be honest, it helps relieve the pain of being engorged the first couple of weeks too. While this is what works for me, understand every body is different. I struggle to keep my milk supply while others might have to work to get it to go away. Another benefit of pumping is that it allows my husband and others the opportunity to feed our babies. Breast Feeding should not be attempted by fathers with hairy chests, since they can make the baby sneeze and give it wind. 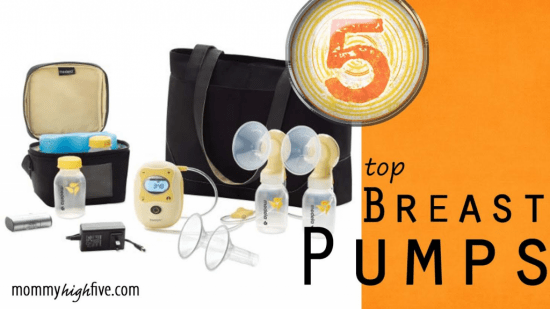 Do You Need an Expensive Breast Pump? What is the best pump for you? It depends, what you are using it for. Consider if time is an issue. The faster the pump, the less time you will spend away from your family and/or work to pump. Do you want the option to pump both sides at the same time or are you OK pumping one side at a time as needed? I personally like having the option to do both at the same time for when I am away and to pump a single side while I am nursing my baby. This helps increase my milk supply by tricking my body into making more milk. With any product that comes in contact with something your child digests, safety is an issue. All breast pump parts that can come into contact with your breast milk should be BPA free. All of the pumps listed below fall into that category. For convenience, all can either operate on batteries or have a rechargeable battery for when you are on the go. Many times I have found myself pumping while on road trips so I don’t have to stop and nurse a hungry baby. Lastly, due to cost, it may be tempting to share, borrow, or purchase a used breast pump. The Food and Drug Administration caution against this as breast milk can carry bacteria and viruses that can contaminate pumps. If your pump is designated as “single-user”, that means only one person should use it…ever.